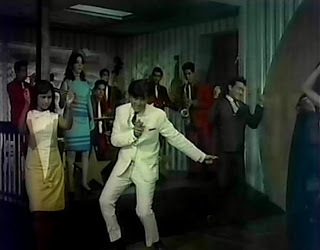 First things first: "Nain Milakar Chain Churana" features Shashi in a pegged mod suit channeling Shammi to a very Beatlesque Kalyanji-Anandji song* sung by Mohammed Rafi, and I can now die happy, the culmination of my life's pop culture passions satisfyingly complete. 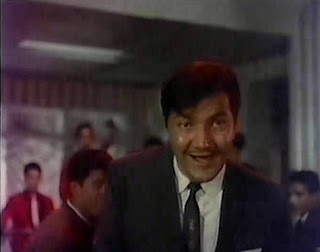 It's so fab, even Prem Chopra does the twist. 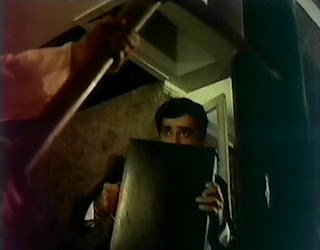 Sapna (Sharmila Tagore) is supposedly annoyed at Gopal (Shashi Kapoor), but while he shimmies her telltale tapping toes under the table give her away. This song has rocketed to my top five Shashi songs (not a formalized list - just a gut concept) and once again shows our man can dance. Even if he couldn't, the music itself, the unassuming group choroegraphy, and the set and costume stylings are so superb that I would watch anybody do anything in its audio/visual setting. Vah vah! Aamne Samne is a fun, nicely contained mystery, mostly hinging on one question: do you trust this man? Note to self: do not base decisions to trust characters on whether Shashi plays them. He's an actor. We first meet Deepak (also Shashi - just hang on, it'll all make sense momentarily) as a gunshot rings out in the dark and he's swarmed by a shouting crowd. He's immediately put on trial for the murder of his wife Vimla, then acquitted, and suddenly in possession of a lot of cash, all cleverly shorthanded by images and just a few bits of dialogue under the opening credits. He goes to Bombay, makes mysterious phone calls, buys a new house...and starts going by the name Gopal. Hmmmmm. Is he a cool, calculating murderer? Or is he a sweet, affectionate widower with a few nervous behaviors who deserves a second chance at love? Gopal's new digs are across the way from Sapna, and he takes a shine to her from his view out the window. They keep bumping into each other, and after a few rounds of her protesting that he's doing it on purpose, she eventually falls for him. Note: Yes, this is stalker-ish. Why do so many movies insist that stalking is cute? We've seen worse - ahem, Dil Se - and Shashi mostly sells it with his wide-eyed heart-tugging cutey-pie persona, but it's still not right. Sadly, Sapna has a boyfriend, Prem (Prem Chopra), and a brother, Pran (didn't catch who this actor is), who is quite keen she marry Prem as planned. Sapna and Gopal continue to meet cute, and their love blooms fully as she nurses him back to health after a harrowing merry-go-round incident. Note: If I weren't already dead, I'd die happy knowing I got to write about a harrowing merry-go-round incident. Well done, movie! Sapna tells Prem and Pran she's choosing Gopal, and they are so enraged by her decision that they both, individually, threaten to kill her. Note: It's a thriller, and we're setting up suspects, but seriously? Both of the preexisting men in her life have to threaten to kill her just because she wants to marry someone else? Sigh. This is where I realized that the movie was directed by Suraj Prakash of Jab Jab Phool Khile and Raja Saab and written by Brij Katyal of JJPK (and Ajooba! my brain is malfunctioning at the idea of the same pen involved in those two wildly different movies!) and I vowed to work to calm my apprehensions and try to enjoy this for what it is. But Gopal hasn't told Sapna about his past, so when strangers call him Deepak and Sapna is almost killed when Gopal isn't around, various people start to get suspicious. Note: I couldn't shake the feeling that I'd seen this movie before, but heck if I can remember where. Aamne Samne is almost a dual role, and it looks like Shashi enjoyed bringing out the different sides of Gopal, making you wonder what he was actually up to. He's good at moral ambiguity. 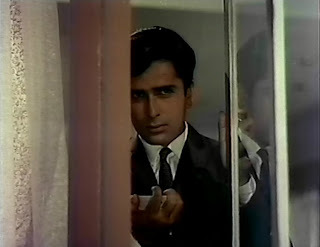 I haven't seen Shashi in many negative roles, but I'm tending to agree with Madhu Jain, author of The Kapoors: The First Family of Indian Cinema, who has a real weakness for Shashi tapping into his dark side. Just when you're ready to go "awwww, he's so cuuuuute," he inches slowly towards Sapna's neck with a curved hand or you remember that he has a gun for no explained reason. Like in Ghajini, we get some different sides of the same character; unlike in Ghajini, we don't know why Gopal sometimes looks so sinister or mysterious, and he doesn't give a lot of cues for when he's going to do something different. Everything Gopal does is Gopal-y - there's no before and after, just this curious man who seems to be many things at once. Note: In other words, Shashi does not Hulk out. Phew. The writing constantly shifts Gopal's behaviors and throws everyone's words into suspicion, creating some really interesting tension. There aren't very many characters in the story, but because we know so little of most of their backgrounds and motivations, there's a lot of potential for secrets, alliances, and schemes as each new suspicious statement or action is added to the mix. Why are Prem and Pran so adamant that Sapna not get close to Gopal? Why doesn't Gopal tell Sapna about Vimla (and why is he Gopal, not Deepak)? Why does the police officer (Kamal Kapoor) not stick closer to Sapna after she's attacked? Why is the cook (Rajendra Nath) getting intriguing phone calls? Why would you agree to go to a hill station if you've already been pushed off a Kashmiri cliff? If Sharmila had more to do, I'd rank this as highly as Teesri Manzil. But there's not much to Sapna other than looking adorable and scared, which Sharmila does well enough, but...snooze. She's in all four of the songs Shashi has (which are all in the first seventy minutes or so! pow pow! ), but there's only one with a female vocal part. What's with that? Still, I enjoyed Aamne Samne very much and was kept wondering until the end. I'd first heard about this one at Indie Quill's post on her favorite Shashi films last year, and it's definitely a treat for us Shashi-pagalis. At just over two hours, I'd recommend it to anyone who wants a relatively controlled mystery that still packs in some songs, a little - mercifully little - comic relief, and a good helping of late 60s fabbity-fabness, too. * Never mind that by 1967, the year this movie came out, this is not how the Beatles themselves sounded. They were experimenting with...sitars and tamburas. Todd, help me before my brain explodes again. And have I mentioned how I want to make an all-Khan Beatles story film, starring Aamir, Fardeen, Zayed, and Shahrukh (in that order, based pretty much just on facial features, except in the case of John/Aamir, because that one's just right somehow despite appearances)? 'Cause I totally do. Anyway, I'm all for music sounding thoughtfully Beatlesque no matter when it was written or who writes and performs it. And yes, I am fond of "Dekho Ab To" from Jaanwar. I've been sold just on that song. OMG. 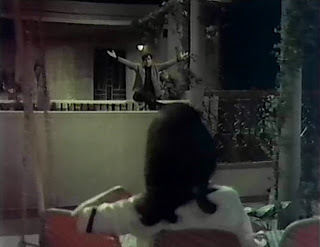 Shashi is hilarious and adorable - and he dances much the same way I do at parties, the ol' "rhythmic electrical shocks to the spinal chord" full-body jerking motion. Now I may have to steal some of his sweet moves (the "swimming man" one was fly!) as well as choreograph everyone to dip as low as they can with me for a particularly high-pitched "diiiiiiil!" I wouldn't call these dancing skillz on the same technical level as, say, Prabhu Deva or Hrithik Roshan... but Shashi's certainly got a lot of dorky charm. Aww, that's a great song. And I still think the twist is the only form of real dance! I haven't seen this film, must get, must get. I love suspense. I love that song, and blast my ears with it waay too much and in bollyhollymusicalitis fits i usually dance to this while walking home! 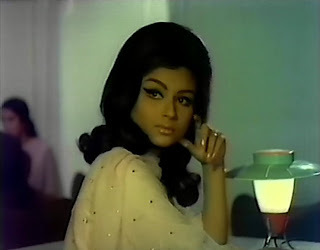 This looks sooo fun and 60's-ish, and i can't resist a bad suspicious Shashi, so i must find this! 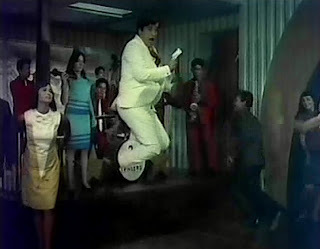 There was another song where Shashi and Prem Chopra did the same kind of dance - London se aaya hai (the movie was Vachan) - which used to play on TV a lot. Cant find it on youtube, though. Looks totally fab even to my cynical and depraved eyes. I think the great thing about the dancing is that it doesn't look like anyone in the room cares how she looks and is instead having her fun just...dancing. Also, I now must listen to "You? Me? Dancing?" by Los Campesinos! PPCC - That is exactly how I felt! I could hardly believe it! I haven't seen any Shashi for a month and this was so precisely what the doctor ordered that I hardly knew what to do with myself. I wish Shashishtyle dancing were more socially acceptable. I'd go dancing way more often. And no, certainly he is no Shahid Kapoor. 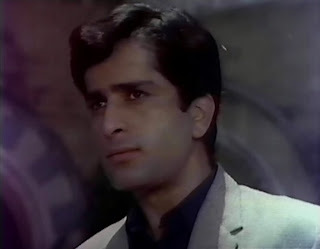 (Though I would like to see Shahid imitate Shashi someday.) Someone should list their thoughts on the dancing skills of the 60s and 70s stars - every time I try to compare him to someone, I get confused by current hot-steppers come up empty. Banno - YEAH! I'm going out dancing with you. I hope you like the movie - I found it well-paced and engaging. Rum - It is super fab, no doubt about it. bollyviewer - Ooooh! Must find! The thing about stalking in this movie is that I sure did want to believe they were coincidences, but he was so mysterious that I couldn't quite believe him! The print was bad - I watched it with Gebruss and she kept saying "Fire! Fire!" when giant smoky smudges would sit on top of the action - but sadly I think you are right that there are some details left unexplained. I wondered how he got her phone number, for example. That sweat-wiping thing was really, really over the top. I was so worried for her! You're probably right - a more skilled hand would have toned a few things down and made this even better. Oh hee, and also, Gebruss and I enumerated a list of Things Not to Do If You Are Actually a Murderer about to Kill Your Wife, so often did Gopal do something incredibly conspicuously suspicious. I concur absolutely about the dancing, and that is what dancing should be like at big social gatherings (not necessarily in glitzy film numbers, but even then, a few here and there are welcome). I did not like this...maybe it was my mood, but I found it just silly and manipulative, and not successfully manipulative and just too full of plot holes. Maybe I'll watch it again one of these days. Personally, I didn't mind the plotholes. The whole thing reminds me of the kind of even then quite elderly murder mysteries I watched growing up, so I suspect I watch it all in a haze of sentimental reminiscence. Also, I found it rather tense the first time I watched it, obviously less so while watching it for the second (or third, or fourth) time, but I am still very fond of it, and the extremely attractive leads sure don't do any harm. 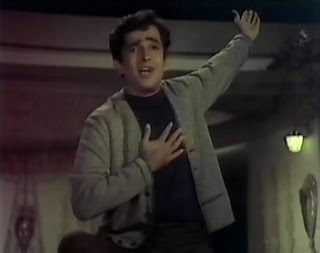 As for Shashi's dancing, my favourite thing about it is that while he may not be technically all that accomplished, he sure gives it all he has if that is required, and he doesn't look like he is suffering agonies of torment while he is doing it. Somehow that make it rather enjoyable to watch. oh memsaab - I can understand that - I've definitely been in the wrong mood for things before and never revisited. It happens. gebruss - HA! Yes, it does have a wee tint of Marple and all, doesn't it? I too found it tense (in a fun way). Shashi's commitment to X is often one of my favorite things about him - I can think of only one performance that I've thought he phoned in, though I was warned long ago that in the mid- and late 70s he basically just showed up, sleptwalk through his lines, and occasionally flashed his megawatt grin. I haven't seen it yet myself, and I hope it's not true. Then again, if one has 8 movies out in a year, it'd be hard to give all of them one's very best, I suppose. cinema paithyam - Welcome! And thank you for the song - I hadn't seen it! Very fun. Ohhhh this is more than my wee heart can take! 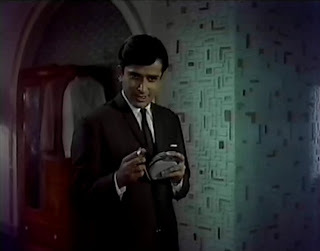 Despite lacking his usual curls, Shashi is so stinking cute/cutely sinister in this movie. Also, I'm pretty sure that your review was what convinced me that I had to see it. Beth - finally got round to reading your review. Nain milakar song is the first one in the movie. As soon as it started, my first thought was "poor sashi, the film guys are making him do a shammi number". The song is infectious and Sashi was a sport in doing this despite his limited dance moves. I wonder if the band in that song is the Ted Lyons one which memsaab keeps spotting in most movies. I noticed that some of the guys playing key instruments in the band seemed to have a blast along with Sashi in the song. 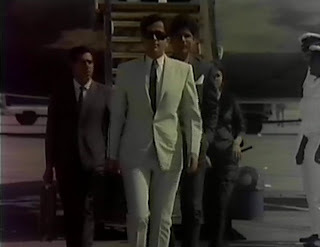 Yep despite the poor picture quality and Sharmila's Topas (high hair dos) this movie is worth watching.